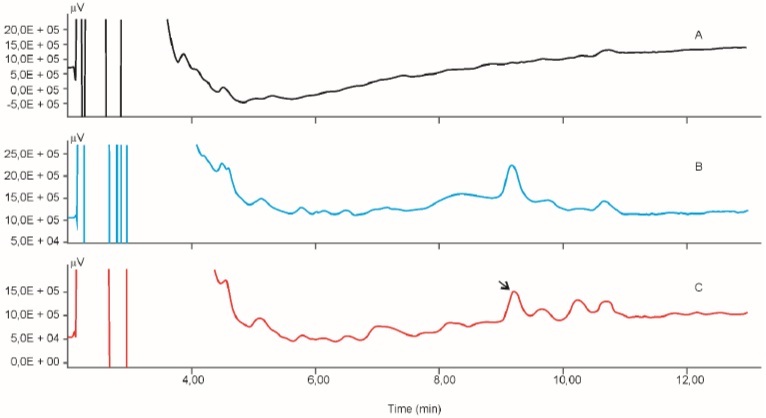 Time-dependence of tissue distribution of selegiline following per os administration to rats. Oral administration of radiolabeled selegiline to rats resulted in a pattern of tissue distribution similar to that following intraperitoneal injection. Analyses were done using both reversed-phase HPLC and also by counting radioactivity in various body compartments of rats. As a consequence of oral administration of 30 mg/kg of selegiline, its level in the stomach was extremely high (179.57 µg/g tissue through 54.67 µg/g at 15 min to 120 min), that is one magnitude higher than that in the serum level. High selegiline concentrations were also detected in the lacrimal glands (7.45 µg/g), kidneys (6.87 µg/g), livers (6.01 µg/g) and lungs (3.47 µg/g) after 30 minutes of application, which were higher than after intraperitoneal injections. Keywords: Selegiline, (-)-Deprenyl, Rats, Distribution, HPLC, Oral administration. Selegiline [(-)-deprenyl hydrochloride] (Fig. 1) is widely used for the treatment of Parkinson’s disease in humans . It is a specific and irreversible inhibitor of the monoamine oxidase B enzyme when used in therapeutic doses [2-4]. Fig. (1). The chemical structure of selegiline (top left) and its metabolic pathway. Ehringer and Hornykiewicz [5, 6] detected that the dopaminergic tone of the human brain progressively declined with age and also in certain diseases. This phenomenon is characteristic of Parkinson’s disease. Selegiline exerts its effect in the dopaminergic system of the brain counterbalancing this decline by multiple mechanisms. Selectively and irreversibly inhibiting the MAO enzyme, selegiline is responsible for the inhibition of the degradation of dopamine , moreover, selegiline inhibits the high-affinity reuptake of biogenic amines (such as dopamine) [7, 8] and also facilitates dopamine release from the corpus striatum . Acute selegiline treatment produces either no or only moderate effect . Following chronic administration, a definite increase in both the dopamine content and the potassium-induced dopamine release in the brain tissue could be observed . In addition to the therapeutic use of selegiline in Parkinsonism, its further beneficial effects have also been published. Knoll, et al. [11-13] found an increased life span of rats as a result of chronic treatments with selegiline and p-fluoroselegiline . Independent research groups [15-17] confirmed Knoll’s results, and claimed that longevity of rats was originated from the inhibition of oxidative enzymes by selegiline [17, 18]. Knoll and Dalló published the positive correcting effect of selegiline and p-fluoroselegiline on sluggish sexual behavior of male rats [14, 19]. Definite incorporation during drug distribution takes place in silent binding sites (such as serum proteins) [20, 21] and active binding sites, such as receptors and various receptor-like binding sites, such as special sites including enzymes . Active binding sites can be the target of drug for drug discovery . The effect of drugs serves to locate their binding site(s). Our recent publications definitely suggested incorporation of selegiline in the brain and testes following i.p. administration [24, 25]. Similarly, deuterated fluoroselegiline showed incorporation and served for PET studies of monoamino oxidase B in the cynomolgus monkey brain . In pharmacological experiments on the distribution and metabolism of selegiline, intravenous and intraperitoneal injections are administered in order to avoid the first-pass effect of the liver. However, the majority of human treatments prefer oral administration to injection if it is not contraindicated. This paper is devoted to determine time-dependence of tissue distribution of selegiline following per os administration to rats. Selegiline hydrochloride (Fig. 1) was the kind gift of Chinoin Pharmaceutical and Chemical Company, Budapest, Hungary (its recent name is: Chinoin Sanofi-Aventis, Budapest, Hungary). Radiolabeled selegiline (14C-methyl) was synthetized in the Isotope Institute (Budapest, Hungary) with a specific activity of 1.851 MBq/mg. Sodium citrate, disodium phosphate, octane sulfonic acid sodium, Na2-EDTA, hydrogen peroxide and HPLC grade acetonitrile were purchased from Sigma-Aldrich Kft. (Budapest, Hungary). Soluene-350 and Optiphase scintillation cocktails were purchased from Perkin Elmer (PER-FORM Hungária Kft, Budapest, Hungary). Male Wistar rats were supplied by Toxicoop (Budapest, Hungary) weighing 195 – 205 gram. The experimental protocol was approved by the ethical committee of ANTSz (Budapest, Hungary) with a permission number 1810/003/2004. All experimental conditions conformed to 86/509/EEC regulation. Rats (in each group n = 3) were orally (per os) treated with 30 mg/kg 14C-labeled selegiline dissolved in saline. The rats were sacrificed following 15, 30, 60 and 180 minutes of treatment. Blood, CSFs, urine, faeces, the brains, lacrimal glands, salivary glands, testes, kidneys, livers, lungs, hearts, stomachs, eyes and cochleas were isolated or dissected. The samples were kept at -80 ºC until analysis. The samples were homogenized in 0.3 M of perchloric acid using Ultra Turrax T25 homogenizer (IKA Labortechnik, Staufen, Germany) at 20,000 rpm for 30 sec at room temperature. Homogenates were centrifuged at 14,000 rpm for 20 min at 4 ºC in an Eppendorf centrifuge, (A. Hettich, Tuttlingen, Germany) and supernatants were used for selegiline determination by RP-HPLC. Calibration curve was constructed with triple injections of 6 spiked standard samples from 0.1 µg/ml through 5 µg/ml selegiline (Fig. 2). Selegiline levels in the samples were calculated by the mean of the results of triple injections. Fig. (2). Calibration curve for determination of radioactivity. The set-up for HPLC was purchased from ABL&E Jasco (Budapest, Hungary). It consisted of a JASCO DG-2080-54 Degasser, JASCO PU-1580 Pump, JASCO AS-2057 Plus Automatic Sample Injector, an Intro EC detector (Antec, Leyden, the Netherlands), a JMBS Hercule 2000 Chromatography Interface and a Borwin 1.50 Controller and Evaluation Software. The stationary phase was a Zorbax Rx-C18 (4.6 mm x 250 mm x 5 µm) column purchased from Kromat Kft (Budapest, Hungary). The mobile phase was a 2:8 (v/v) mixture of acetonitril: aqueous buffer at pH 3.7, while the buffer was the solution of 10 g citric acid, 10 g trisodium phosphate, 100 mg OSA, dissolved in 600 ml HPLC quality of water, which was completed to 800 ml. Temperature of the column was kept at 35 ºC and analyses were done using 1 ml/min flow rate. An injection volume of 75 μl was applied. An Intro EC detector using amperometric detection mode at 0.95 V was used and the total range was 2 nA. About 100 mg of each liver, brain, lacrimal glands, salivary gland and testes were transferred into 20 ml scintillation vials. 1.5 ml Soluene-350 was added to each sample, kept at a 60 ºC water bath for 90 minutes and was then cooled down to room temperature. Afterwards, 0.2 ml of 30% hydrogen peroxide was given in two portions (that is twice 0.1 ml) and was shaken well after each portion. The samples were kept at room temperature for 30 minutes, followed by keeping at 60 ºC for 30 minutes. After cooling down to room temperature, 10 ml scintillation cocktail was given to each sample and radioactivity counting was performed after 12 hours in a Beckman LS-5000TA counter. The treatment of serum and urine samples was similar except that 50 µl of the samples was taken. Moreover, 0.5 ml isopropanol was also given to the samples following treatment with 30% hydrogen peroxide and provision of the scintillation cocktail. Fig. (3). 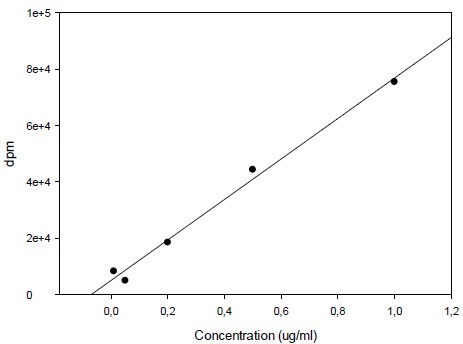 Calibration curve for HPLC determination of selegiline. 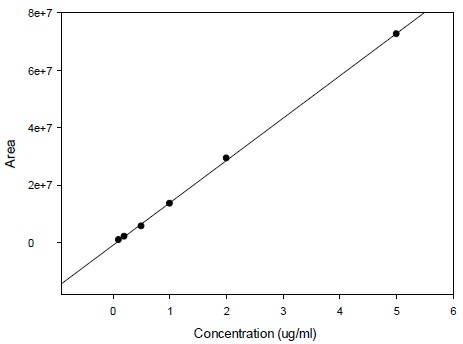 Calibration curve for the determination of radioactivity is given in Fig. (2). Fig. (3) gives an HPLC determined calibration curve of non-metabolized selegiline. Fig. (4) triplet gives a representative chromatogram of selegiline in testis. Fig. (4a) shows the chromatogram of blank (untreated) testis. Fig. (4b) shows the chromatogram of testis spiked with selegiline and Fig. (4c) gives the chromatogram of testis from a selegiline-treated rat. Fig. (4). Representative chromatograms for HPLC determination of selegiline in testes. Table 1 provides the results of radioactivity determinations in the tissues and body fluids. Radioactivity is expressed in µg/g or µg/ml, based on dpm/g wet tissue or dpm/ml body fluid. Radioactivity indicates the presence of the metabolically intact selegiline plus its major metabolite and the level of (-)-methamphetamine (Fig. 1). Table 1. Selegiline (and methamphetamine) content of various body compartments of rats following p.o. treatment with 14C-labeled selegiline. All data are calculated using the calibration curve and from determination of radioactivity. Table 2 provides the non-metabolized selegiline content of body fluids and tissues of rats on the basis of HPLC determinations. Triplicate determinations were carried out. The tissue level of selegiline in the stomachs was extremely high at each sample (15, 30, 60 and 120 mins) as selegiline was administered orally and the decline during the experimental period indicates its transfer into the ileum. High contents of selegiline were detected in the lacrimal glands, the kidneys, the livers, and in the lungs at all of the time points detected. Pharmacokinetics shows the upmost increase of selegiline in the livers, as well as a definite (but moderate) increase in the lacrimal glands, cochleas and kidneys. Table 2. Non-metabolized selegiline content of various body compartments of rats following p.o. treatment with 14C-labeled selegiline. All data are calculated using the HPLC. The chemical structure of radiolabeled selegiline (Fig. 1) shows that the N-methyl group contains the source of radioactivity in the form of 14C. However, the major metabolite of selegiline is methamphetamine which maintains the radioactivity keeping the 14C-methyl group as well [27, 28]. In Ehrlich's beloved Latin terminology: Corpora non agunt nisi fixata (agents only work when they are bound) . The key–lock principle led to the side-chain theory of antibody formation, which became a cornerstone of the newly-emerging discipline of immunology recognized by the Nobel Prize. Ehrlich formulated his ideas in chemical terms, speaking of “chemical affinities” in biological processes (e.g. toxin/antitoxin or antigen/antiserum complexes, “magic bullets” seeking specific targets). Some three decades of his experience were epitomized in his maxim, “Corpora non agunt nisi fixata, i.e. a substance is not (biologically) active unless it is “fixed” (bound by a receptor)”. Penetration of selegiline into the testis is thereby of basic importance from the point of view of MAO enzyme inhibition. Roberge, et al. reported the dependence of activity of human seminal plasma on its level of monoamine oxidase. As early as thirty years ago, an observation was made according to which the MAO enzyme was present in the seminal plasma and a higher MAO activity was detected in infertile men than in fertile ones. Monoamine oxidase (MAO) content and activity in the testes show changes during sexual differentiation [31, 32]. MAO inhibitors affect the copulatory behavior of male rats . At the same time, there is a blood-testis barrier and its function is to select penetration of both xenobiotics and endogenous compounds [34-37]. A recent publication by Mihalik, et al. claims the favorable effect of selegiline on the increase in the number and motility of sperms of male rats following chronic intraperitoneal treatment with selegiline. Pharmacokinetics of orally given selegiline are subjected to the alterating influence of its first-pass effect. Oral administration of various drugs used in humans is generally preferred to any other (i.p., i.v., s.c.) except in the special cases. This is the reason why oral treatments are carried out. However, pharmacology can use either i.p. or i.v. administration to avoid the first-pass effect of the drug. This method has been used and reported in our preliminary publications [9, 24, 25, 27]. However, to monitor the pharmacokinetics related to the use of selegiline in humans, oral administration should be applied. Certain fluctuations in the selegiline levels in the serum, brain, etc. must be the formation and completion/saturation of the first-pass effect of the liver. A high deprenyl level was found in the stomachs, kidneys, lacrimal glands, livers and lungs after 15 minutes of administration, indicating the site of absorption as well as the major excretion routes. The relatively constant selegiline levels in the brain and testes show the sites where selegiline is bound by the monoamine oxidase enzyme. This interaction can cause an inhibition of this enzyme resulting in an elevated number and motility of sperms. Kalász Teaching and Research Co (Budapest, Hungary) and the Hungarian National Granting Agency have financially sponsored this project with OTKA No. 100155 grant. Cooperation with and advice by Dr. Tibor Zelles and Mr. János Horváth are highly appreciated. Standaert DG, Roberson ED. Goodman & Gilman’s The Pharmacological Basis of Therapeutics. 12th ed. McGraw Hill Medical 2011; pp. In: 609-28. Ecseri Z, Kósa I, Knoll J, Somfai É. Process to develop a new drug containing optically active derivative of phenyl isopropylamine Hangarian Patent, 154655 1965. Magyar K, Knoll J. Selective inhibition of the B form of monoamine oxidase. Pol J Pharmacol Pharm 1977; 29(3): 233-46. Ehringer H, Hornykiewicz O. Verteilung von Noradrenalin und Dopamin (3-Hydroxytyramin) im Gehirn des Menschen und ihr Verhalten bei Erkrankungen des extrapyramidalen Systems. Klin Wochenschr 1960; 38: 1236-9. Hornykiewicz O. The discovery of dopamine deficiency in the parkinsonian brain. J Neural Transm Suppl 2006; (70): (Suppl.)9-15. Tekes K, Magyar K. Effect of MAO inhibitors on the high-affinity reuptake of biogenic amines in rat subcortical regions. Neurobiology (Bp) 2000; 8(3-4): 257-64. Magyar K, Szende B, Lengyel J, Tekes K. The pharmacology of B-type selective monoamine oxidase inhibitors; milestones in (-)-deprenyl research. J Neural Transm Suppl 1996; 48(48)(Suppl. ): 29-43. Knoll J. The striatal dopamine dependency of life span in male rats. Longevity study with (-)deprenyl. Mech Ageing Dev 1988; 46(1-3): 237-62. Knoll J. The pharmacology of selegiline ((-)deprenyl). New aspects. Acta Neurol Scand Suppl 1989; 126: 83-91. Kitani K, Kanai S, Sato Y, Ohta M, Ivy GO, Carrillo MC. Chronic treatment of (-)deprenyl prolongs the life span of male Fischer 344 rats. Further evidence. Life Sci 1993; 52(3): 281-8. Kitani K, Kanai S, Ivy GO, Carrillo MC. Assessing the effects of deprenyl on longevity and antioxidant defenses in different animal models. Ann N Y Acad Sci 1998; 854: 291-306. Kitani K, Kanai S, Ivy GO, Carrillo MC. Pharmacological modifications of endogenous antioxidant enzymes with special reference to the effects of deprenyl: a possible antioxidant strategy. Mech Ageing Dev 1999; 111(2-3): 211-21. Budni P, de Lima MN, Polydoro M, Moreira JC, Schroder N, Dal-Pizzol F. Antioxidant effects of selegiline in oxidative stress induced by iron neonatal treatment in rats. Neurochem Res 2007; 32(6): 965-72. Müller WE, Wollert U. Human serum albumin as a silent receptor for drugs and endogenous substances. Pharmacology 1979; 19(2): 59-67. Szökö E, Kalász H, Kerecsen L, Magyar K. Binding of (-) deprenyl to serum proteins. Pol J Pharmacol Pharm 1984; 36(4): 413-21. Rang HP, Ritter JM, Flower RJ, Henderson G. Rang and Dale’s Pharmacology. Amsterdam: Elsevier Science B.V 2016; pp. 482-97. Waldman SA, Terzic A. Pharmacology and Therapeutics - Principles to Practice. Philadelphia: Saunders 2009; p. 7. Kalász H, Tekes K, Pöstényi Z, Proszenikov A, Vizvári E, Tóth-Molnár E. Pharmacokinetics of selegiline in a rabbit model. Lett Drug Des Discov 2016; 13: 752-6. Nag S, Varrone A, Tóth M, et al. In vivo evaluation in cynomolgus monkey brain and metabolism of [18F]fluorodeprenyl: a new MAO-B pet radioligand. Synapse 2012; 66(4): 323-30. Kalász H, Magyar K, Szőke É, et al. Metabolism of selegiline [(-)-deprenyl)]. Curr Med Chem 2014; 21(13): 1522-30. [(-)-deprenyl)]. Szathmari I. Milestones in Monoamine Oxidase Research: Discovery of (-)-Deprenyl. Budapest: Medicina Publishing House Co. 2000; pp. 61-80. Ehrlich P. Chemotherapics, Scientific principles, methods, and results. Lancet 1913; 2: 445-51. Roberge AG, Moufarege A, Lavoie J, Roberge C, Tremblay RR. 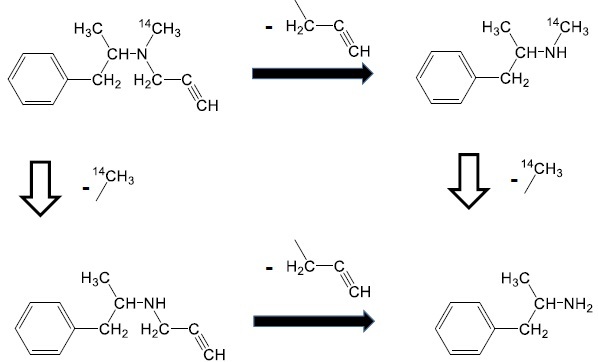 Biochemical properties and kinetic parameters of monoamine oxydase in human seminal plasma. Int J Fertil 1984; 29(3): 180-5. Gaziri LC, Ladosky W. Monoamine oxidase variation during sexual differentiation. Neuroendocrinology 1973; 12(4): 249-56. Dewsbury DA, Davis HN Jr, Jansen PE. Effects of monoamine oxidase inhibitors on the copulatory behavior of male rats. Bull Menninger Clin 1972; 36(1): 209-17. Mruk DD, Cheng CY. The mammalian blood-testis barrier: its biology and regulation. Endocr Rev 2015; 36(5): 564-91. Alves MG, Dias TR, Silva BM, Oliveira PF. Metabolic cooperation in testis as a pharmacological target: from disease to contraception. Curr Mol Pharmacol 2014; 7(2): 83-95. Jiang XH, Bukhari I, Zheng W, et al. Blood-testis barrier and spermatogenesis: lessons from genetically-modified mice. Asian J Androl 2014; 16(4): 572-80.